Our innovative technology enables us to shrink MEMS (Micro Electro Mechanical Systems) sensor structures so that our nanoscale sensor structures are up to ten times smaller. To be specific, current MEMS structures have feature sizes of one micron or larger while our NEMS (Nano Electro Mechanical Systems) structures have features of 0.3 microns or less. This is a 10x area reduction. 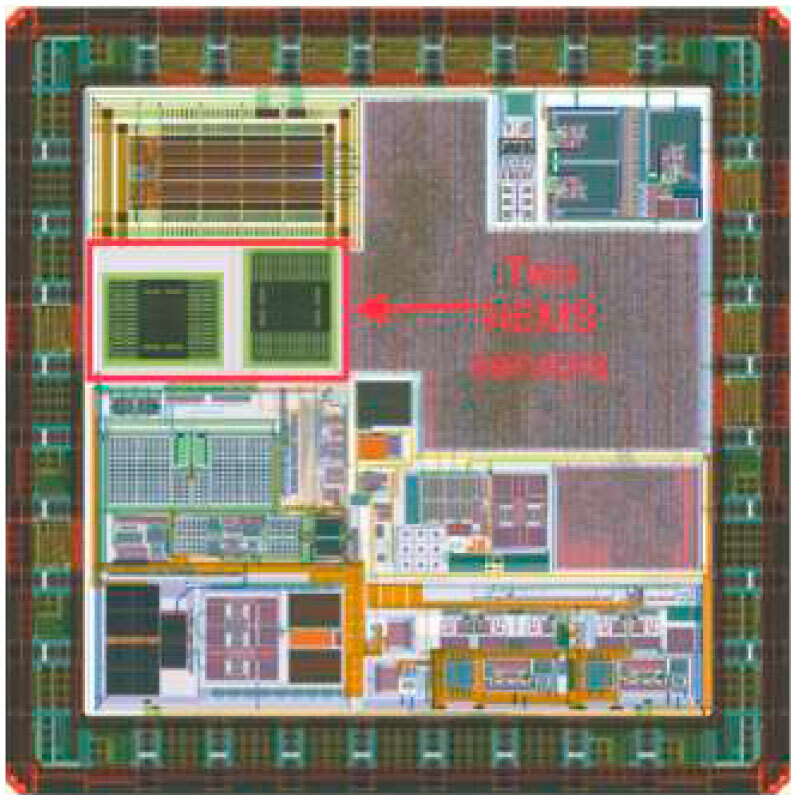 A typical MEMS sensor package needs two chips – one with the MEMS structure built on it and the second with the control electronics, resulting in a package of 4mm3. Our equivalent NEMS sensor package has everything on one chip and is only 1mm3 so we free up 3mm3 for every sensor that we replace with one of ours. For example, three sensors replaced frees up 9mm3 and needs less PCB real estate and support components. This valuable space can be used for additional batteries, more sensors or extra features. Chip layout showing two motion sensor structures integrated with the control electronics on a single chip. Additional NEMS sensor structures can be added to the same chip with hardly any increase in size. In the example shown of two motion sensor structures, they only take up about 10% of the chip. Additional sensor structures would be similar in size and most of the control electronics is shared, hence a multi-sensor solution is only slightly larger. We have invested over fifteen years and more than fourteen million Euros in Research and Development to perfect our unique approach of building NEMS structures within the CMOS layers. We create them from metal layers using standard CMOS techniques and then etching away the appropriate silicon dioxide areas to form a cavity so that they can move freely. They are made at the same time as the control electronics beside them to form a one chip solution, all made using standard CMOS processes. CMOS was never designed for this and the released metal structures suffer from stress and distort. We have solved this with unique structure designs that we have created for the various sensor types that we do. We are protecting these designs with comprehensive patents to secure our position as the only company with NEMS-within-CMOS. Please see Technology for more details. MEMS sensors provide the vital interface between the real world and electronic devices. They are in almost every electronic device that needs awareness to make them smarter – from computers to cars and from phone to earbuds. Our disruptive technology will revolutionise this multi-billion-dollar sensor market by removing the barrier to high volume production as we can use any CMOS fab. Also, unlike current MEMS, we can enjoy the cost-saving benefits of CMOS shrinking to smaller nodes. The reason that IoT has not really taken off is because, currently, MEMS are not cheap enough and not small enough. Plus, because every MEMS product needs its own special production process, there are no economies of scale and it is hard to ramp up the numbers that can be produced, except by creating a duplicate production line. We can make our NEMS in any of the big semiconductors facilities (fabs) so there is no limit to how many we can produce, plus we have the economies of scale provided by these fabs. As a result, IoT will finally take off with our unlimited supply of inexpensive, nanoscale sensors taking the MEMS market from billions to trillions. Nanusens is a VC-funded, UK-based company that specialises in creating nanosensors inside CMOS. Its expertise and pending patents place it as the uncontested leader in this technology that will revolutionise the next generation of sensors. 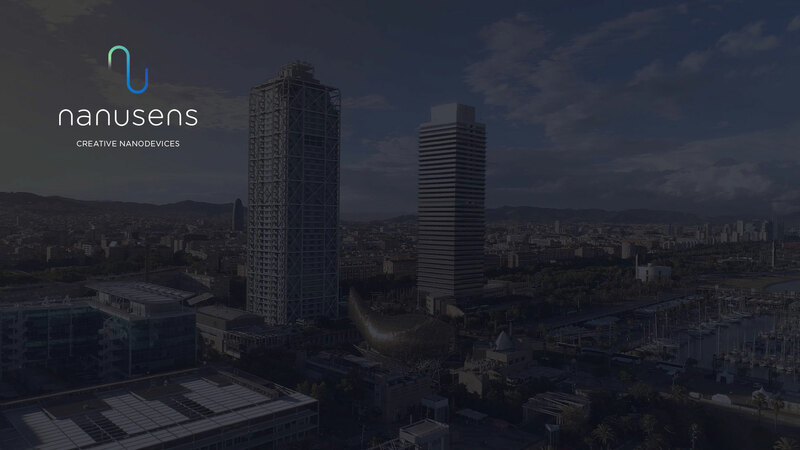 WANT TO JOIN US ON OUR JOURNEY TO CHANGE THE WORLD OF SENSORS? This could be your last chance to invest in Nanusens at a low valuation! UK investors can benefit from Nanusens qualifying for EIS. Click to download the pdf of our brochure on our technology and its benefits.